The new cancer treatment. Cancers and tumours successfully extracted by the scientific practice of organic preparations, without administration of chloroform or the aid of the knife; with an account of sixty cases of the improved treatment, accompanied by upwards of fifty testimonials in favour of the new method. Cheltenham : T. Hailing, 1876. Description : [2. ed. ], frontis., [i]-xiii., 111 p. ; ill.: 1 phot. ; 22 cm. Photograph : frontispiece, woodburytype (unverified) portrait of the author on printed leaf. Photographer : William James Suter. Subject : Quackery — Herbal medicine. Author caption: By D. Turnbull, M.D., LL.D., (registered) licentiate of the Royal Colleges of Physicians and Surgeons, Edinburgh; physician and surgeon to the Late Medico-Eclectic Dispensary, late editor of The New Era of Eclecticism, member of the eclectic medical society of Pennsylvania and member of the National Eclectic Association, United States of North America. Sued for practicing medicine without a licence, 1860. First edition title: The new surgical mode of extracting Cancer, without administration of chloroform, or the aid of the amputating knife. With an account of seventeen examples of the improved treatment, etc. (Appendix. The eighth annual report of the Cheltenham Medico-Eclectic Dispensary, etc.). Third edition, enlarged and revised, 1881. Photo caption: facs. signature of the author. 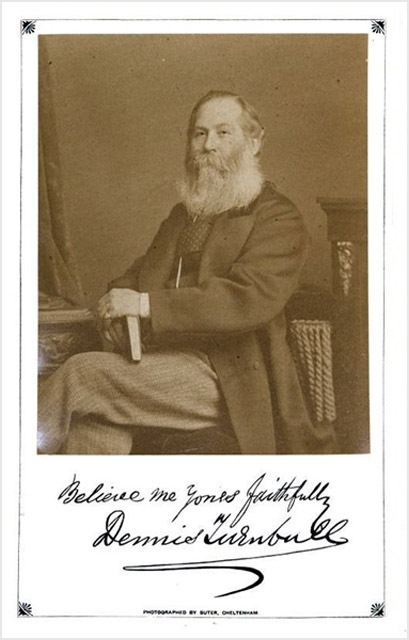 Photo caption: Photographed by Suter, Cheltenham.